There were 264 press releases posted in the last 24 hours and 153,582 in the last 365 days. Lucyd shares new details on television features, forthcoming product lines and its new patent application. SINGAPORE, February 20, 2019 /EINPresswire.com/ -- Lucyd is pleased to announce several developments as the go-to eyewear shop for fashion and tech-conscious millennials. 1. Lucyd Loud music glasses were just featured TWICE on CBS in California in the last month. First, in a "Best of Tech" recap of CES 2019, visible here on CBS San Diego. Now this week, Lucyd Loud received a full three-minute feature on Good Day Sacramento, which can be watched here. Lucyd is also preparing to release a promo commercial featuring Brand Officer & NFL pro Richard Sherman, in early March. 2. Lucyd was also featured in print and online in the Boston Globe, a large newspaper serving New England. Read the article here. 3. Lucyd Loud 2.0, featuring ten modern styles and a slimmer, more comfortable fit, is planned for introduction to the global market in Q2 2019. 4. 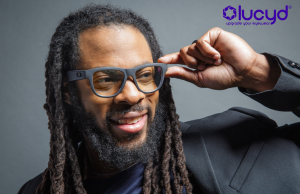 A line of sporty designer sunglasses called Sherman Shades, designed in tandem with Richard Sherman, is planned for release in Q3 2019. Sherman Shades will offer a selection of high-quality, active-lifestyle sunglasses at a very affordable price. 5. Lucyd has filed a new utility patent on an IOT communication app called LINK. Its purpose is to improve inter-device communications and control. We are also filing a number of design patents on Lucyd Loud 2.0. 6. Lucyd has launched a Student & Military discount program, giving $10 gift cards to the Lucyd eshop to service personnel and students. To receive, they must simply email info@Lucyd.co with appropriate identification. "With all of these positive developments, and more on the horizon, Lucyd is poised to become a leader in a new generation of web-based eyewear providers."